In North American media, discussion and analysis of the laws adopted by our legislative bodies is an everyday occurrence. Entire news programs are sometimes devoted to analyzing major legislative initiatives. Legal experts and constitutional experts are routinely consulted and quoted in the media for purposes of informing the public about the meaning, implications, and constitutionality of the laws adopted by our legislative bodies. But in North America there is an older law, a law that predates the creation of the United States and Canada, that is rarely discussed; and that is the Great Law of Peace. The Great Law of Peace is the oral Constitution of the Iroquois Confederacy. The original five member nations ratified this Constitution near modern-day Victor, New York, with the sixth nation, the Tuscarora, being added in 1722. The laws were first recorded and transmitted not in writing, but by means of wampum symbols that conveyed their meaning. 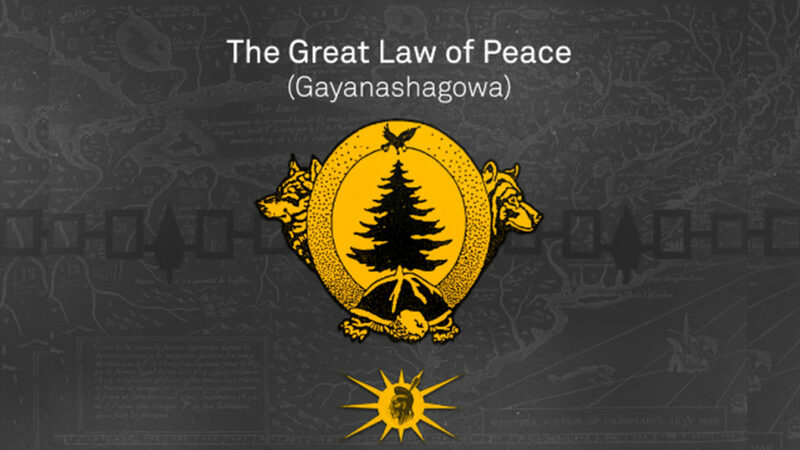 Later, the Great Law of Peace was translated into English, and various other accounts exist. The law is called a constitution and is divided into 117 articles. Now here to discuss this with us is Stuart Myiow, Wolf Clan Representative of the Mohawk Traditional Council, Kahnawake of the Five Nations Longhouse Confederacy, Turtle Island. Stuart was born and raised on the Mohawk reserve of Kahnawake, just 15 minutes from downtown Montreal where I am, and he was raised exclusively within the ceremonial cycle of the traditional longhouse people. Thank you very much for joining us today, Stuart. STUART MYIOW: Thank you very much. DIMITRI LASCARIS: Stuart, I would to ask you to begin by explaining who the Peacemaker is, and what is his relationship to the Great Law of Peace. STUART MYIOW: OK. Very complicated question, but basically he is the being, the person, who happened to fill the role in the place and time in history where the people were at a stage, a level of corruption, of war. And whenever the people are in war, of course there’s always going to be somebody that is going to be pushing for peace. And whoever that person may be at that time, whatever their name is, that makes them a very important person. Within the Five Nations. That person’s name was Deganawida. Now, that person is the one that brought what you identified, the Constitution of the Great Law of Peace, to the people who were at war with each other. Once this law was brought to those people, then the people united not under some agreement that they would make with each other, but they united based on a commonality between all living beings. Not a commonality just between humans, but a commonality between all living beings whereas then the people would live in accordance with the structures of creation. Not the structures that men create, but the structures of creation. So this was done approximately 2,200 years to 24,00 years ago. And this is what gave birth to the great peace amongst the people. And as you know, when the people are at peace, then it has its effects, its profound effects, upon all things in creation. 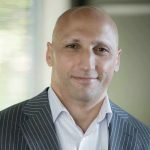 DIMITRI LASCARIS: As I mentioned at the outset, and as you’ve clarified, the Great Law of Peace pre-dates the creation of the United States and Canada by quite some time. Did the Great Law of Peace in Europe, in your view, influence the drafters of the American and/or the Canadian Constitutions? And if so, how did it influence them? STUART MYIOW: OK. Well, there’s a two-tier answer to that. You have in the non-Native world, you have the history that is recorded, and you could find in the non-Native history of the United States in their early days of its creation that Benjamin Franklin and Thomas Jefferson both had seats of honorarium sitting right in the middle of the grand counsel, where this is a history that was passed on from generation to generation within the oral tradition, through the chiefs and clan mothers to the people of the Great Law of Peace. But then there is again, like we said, the history that you could find out very easily of Benjamin Franklin giving the earliest references to the Great Law of Peace and the Five United Nations identifying- maybe I don’t have his exact words here, but you could find this out- where he said that it would basically be ridiculous for the 13 colonies not to be able to unite in peace when, as he stated, that these five primitive tribes, as he said, were able to attain it amongst ourselves. DIMITRI LASCARIS: Now, Europeans and their descendants like to believe, perhaps with some justification, that their ancient cultures ,particularly the Greek culture, are really sort of the foundation of the wellspring of what we understand to be democracy today. In your view, does the Great Law of Peace embody principles that are sort of foundational democratic principles? And if so, how does it do that? STUART MYIOW: No, it does not. Democracy and freedom are exact polar opposites. This is one of the issues that is wrong in a non-Native world, that when you, for instance, if you are wanting to make a cake, while you’re using a recipe that instead of making a cake it’s making something else, it’s making pie or something. Democracy cannot in any way be equated to peaceful representation and freedoms of the people because when we look at the people, at the origins in the non-Native world of democracy, we look at the early Greek society. And we can look there. What are the similarities to what you believe in your mind what democracy is, and what it actually was back then? So today you may look and think that democracy means freedom and equality for all. Well, let’s go back to early Greece and we’ll see that that’s not, in fact, what existed there. And that’s not what I am saying based on what I think. I examined the non-Native history. The non-Native history identifies the circumstances that were in place at the time when the early Greeks formed democracy. In that place they were entirely based upon slavery. They were entirely based upon war. The women were not citizens. The women were basically subjects of the men, owned by the men. The majority of the women were slaves also except from the ones that were allowed or permitted to come into the ranks of basically being, or holding the role of basically being baby factories to bring more soldiers into their war. So when people think of democracy as, the way people think of it today, the people are exactly going in the diametrically opposite direction than what they believe. Whereas within the Great Law of Peace, this is the only place on earth that actually acknowledged an adopted Constitution of what actually takes place within creation; how creation is created from some step one. In order to know the Great Law of Peace that people must know the creation story. When you know your creation story, then you know what you are. And when you know and realise what you are, then your ways, everything that you adopt, will be in accordance with what we are. So the knowledge of the Great Law of Peace starts from the very beginnings of creation. And this is what has been handed down throughout time until the time where we come into the form as humans. When humans come into our form we still already have within us, within our DNA structure, complete knowledge and history of everything that is taking place throughout time, from the instance of creation up until when so-called modern man begins to walk. So we have all of that embedded in our DNA. So when we get to this stage as humans, we must now have our way in accordance with that creation. So that Geat Law of Peace is something that recognises the matrilneal authority, the matrilineal reality of creation, whereas democracy goes completely against creation where it goes based on a male-dominant structure; which is, of course, nowhere in touch with reality of creation. DIMITRI LASCARIS: Well, Stuart, I’d like to continue our conversation in a second part. I think we have a lot more ground to cover, and it’s very important ground that we should cover. So in part two I’d like to flesh out with you some of the more particular provisions relating to concepts of equality, relating to concepts of basic fundamental rights and freedoms and so forth, and get a better understanding of what the Great Law of Peace embodies. So for the time being we’ll, we’ll just pause our discussion there and look forward to part two. And thank you very much for joining us today, Stuart.